What do you do when you win a treadmill, and you’re in a wheelchair? And it happens on national television in front of a live audience? You make a joke about it and move on, just like Danielle Perez did. 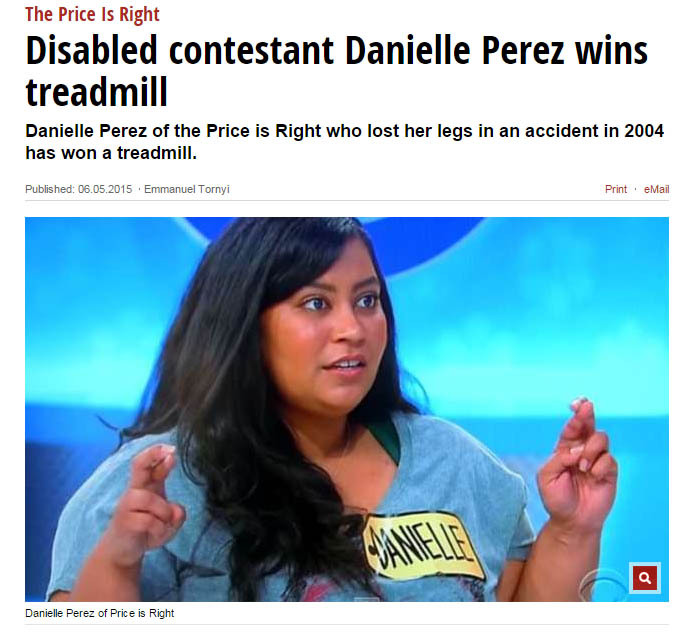 Perez recently won both a treadmill and sauna on The Price Is Right, in front of a squirming and uncomfortable live game show audience. What’s ironic is that she was probably one of the least uncomfortable people there. Living life from a wheelchair for the past 11 years after losing both of her legs in an accident, she is accustomed to making people uncomfortable and working her way through awkward situations. Able-bodied people are often uneasy around disabled people, especially strangers. They don’t know to react to someone who looks differently from them or someone like me who moves differently. This uneasiness is no one’s fault. It’s just human nature. When we encounter another human with obvious physical struggles, we want to help, but we often don’t know how or what would be appropriate. I see it often when I walk or roll through a room full of strangers. Many try to hide it, but I can see the emotion in their faces. Sometimes, it’s anxiety. Sometimes, it’s pity. Sometimes, it’s genuine fear. My wife and I visited a very nice restaurant on our recent trip to Las Vegas. Though our anniversary isn’t until later this summer, we decided to celebrate early with a dinner at The Eiffel Tower Restaurant. The restaurant, which overlooks the fountains at the Bellagio, is much nicer (and more expensive) than the restaurants we usually visit, but we were celebrating, so we decided to splurge a little. On our way to the table, I tripped over my feet and fell to the ground. The spectacle that ensued captured the interest of most of the restaurant’s patrons. Before I had a chance to register the fall and assess my situation, no fewer than four people suddenly appeared at the scene of the crash, and all tried to lift me at once. I joked that it would be nice if I could get restaurant staff to react as quickly when I need a refill on my iced tea. After I was on my feet and moving again, they hovered around me, like parents watching their toddler walk for the first time. Perez felt the audience’s discomfort, and for a brief moment, thought that it might be a joke. When she realized it wasn’t, she charged forward, never losing her confidence or sense of humor. She even refused assistance and spun the famous wheel by herself. Later, when asked what she planned to do with her new treadmill, she deadpanned that she would use it in the same way most people use exercise equipment, like extra furniture. We all have uncomfortable, frustrating or disheartening moments. Maybe we blow a presentation at work, trip over the curb and rip a hole in our pants or have someone treat us in a disrespectful manner. Like Danielle Perez, we have a choice to make at moments like these. We can lash out in bitterness or laugh it off and move on. When we use humor to defuse tense situations, we draw people in and make them feel comfortable, and we project positive energy. When we project positive energy, we get positive returns. Not only did Perez become an instant celebrity, Jimmy Kimmel invited her to his television program and gave her a Royal Caribbean cruise. The next time you find yourself in an uncomfortable situation and facing a choice of how to react, try using humor and positive energy. Sometimes, you just have to laugh.